American paper companies experienced difficulties obtaining paper pulp even before the United States entered World War II due to restrictions on its production in Canada, the major supplier of the essential material. Strathmore did not feel the pinch, though, as much as other paper companies since its papers had a 25% or higher rag (cotton or linen) content. But the creeping restrictions by the War Production Board Pulp and Paper Division on the amount of paper used by printers and publishers eventually forced Strathmore to reduce its paper lines in half from 33 in 1941 to a mere sixteen by the end of 1943. While the design of an individual book may be considered entirely successful according to accepted standards, there always remains the interesting possibility that a better book might still be made. Judgment on a single example of creative effort can, therefore, never be conclusive. Thus, he invited four book designers to each interpret Cape Cod by Henry David Thoreau. The four signatures, each of which included a title page, chapter opening and text page, were designed by Helen Gentry (1897–1988) of the Gentry Press; William A. Kittredge (1891–1945), Director of Design and Typography at R.R. Donnelley & Son, The Lakeside Press; Rudolph Ruzicka (1883–1978); and D.B. Updike (1860–1941) of The Merrymount Press. The inclusion of Gentry made for an interesting quartet. She was the first artist/designer from west of the Mississippi that Strathmore had used, and one of the few women. To make sure that Strathmore customers understood the purpose of the book, “Considerations on the Choice of Paper,” an essay by Carl Purington Rollins, Printer to Yale University, preceded the sample book designs (each of which was illustrated). Cover of A Demonstration of Two Strathmore Book Papers (West Springfield, Massachusetts: Strathmore Paper Co., 1940). Design by D.B. Updike. Photograph by Ariel Smullen. 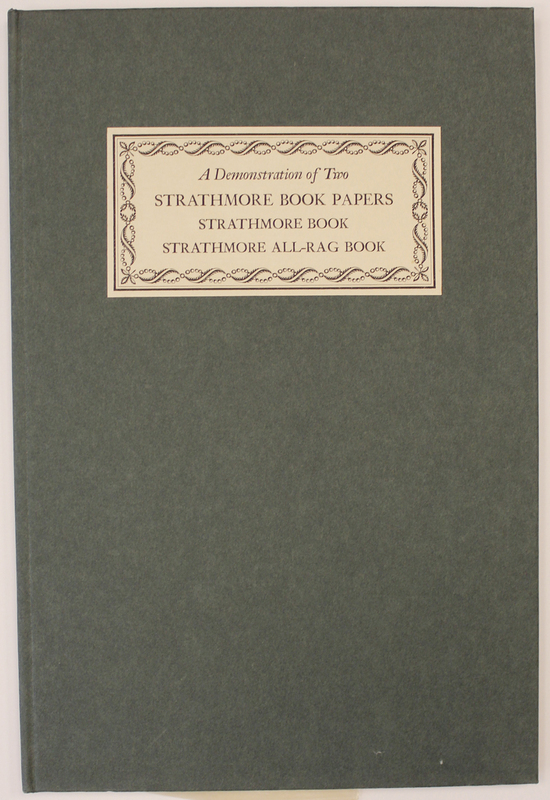 Strathmore All-Rag Book, a new paper in 1940, was one of the victims of the 1943 paper restrictions. It was discontinued the following year. Wartime printing means simplified printing. It means doing the job economically. It means a new emphasis on efficiency. Expressive printing makes any job you do more effective. Good printing with good design and good paper combine to dramatize the idea… to convey the impression more quickly, with added emphasis. Strathmore Expressive Papers can help you to be sure that the printing you do makes a quality impression instantly. In spite of the present limitations on production, you will find still available in the Strathmore line a considerable variety of expressive colors, textures and surfaces. Strathmore also issued a brochure entitled “How Your Waste Paper Can Help Win the War,” an early advocacy piece for recycling. The paper restrictions were lifted in 1944 and after the war Strathmore began to rebuild its paper lines. By 1948 there were 25 paper lines and by the mid-1950s there were 39, matching the situation in the mid-1930s. The exhibition at The Opalka Gallery did not include any of Strathmore’s wartime material due to lack of space in the cases and to the paucity of items from those years.